New assembly technology of crew cabin was introduced and applied at factory “Prioritet”. The cabin is made of tube all-welded construction from carbon steel. Crew cabin is frame-panel with a plastic exterior made of high-strength reinforced glass fiber and with an interior made of impact-resistant plastic. Fastening of panels to the frame is made according adhesive technologies. The inner and outer lining of the frame is covered with plastic panels. 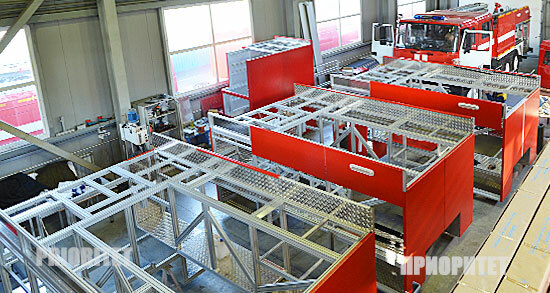 One of the "Prioritet's" firetrucks advantages is that capacious fire-fighting superstructure from special aluminium profile is made as jointless framework and it is sheathed with aluminium sheet with the help of the glue. Besides strength and corrosion stability of this construction, it allows to place a big amount of fire-fighting and rescue equipment and also to adapt arranging and filling of the body due to the possible requirement alteration.